I have enjoyed living in the North and the South. Both areas have their special times. There might be some arguments on this, but I am certain that spring belongs to the South. If for no other reason than we get it first, we own the season. Back in the sixties when I was college student coming home in the spring from Boston, I used to time my trip home so that I would be about half way down the Shenandoah Valley when the sun came up. Depending on the year, it could be spectacular. While those were wonderful green landscapes in stark contrast to the dirty snow of Cambridge, it pales to the memories from the second year after we moved to Columbia, Md from Halifax, Nova Scotia. I had started covering higher education in Virginia for Apple Computer. One of our oldest and best customers was Sweet Briar College, located just south of Amherst, Virginia on US 29. We had suffered through a lot of snow that winter in Columbia, and we were not particularly happy in Maryland. It was an intense immersion into American culture after being away for sixteen years in the more laid back world of Canada. There were a lot of type A people in Columbia. Visiting Sweet Briar that year in the middle of April, convinced me that we needed to move farther south. I often thought that if I could bottle the smell of Sweet Briar in the spring, that I would never have to work again. Between the Dogwoods and other spring plants, I cannot imagine a nicer place in spring. I was pleased when my oldest daughter graduated from there. Along with her graduation, I will always have the sights and smells of that first visit in 1988 burned into my mind. 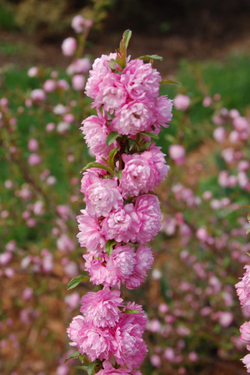 I snapped the picture in the post of the pink flowering shrub, which my Mother called an Almond bush in Roanoke recently. It certainly isn't the only sign of spring. Roanoke's Cherry trees have been particularly gorgeous this year. We have also had the pleasure of traveling across NC recently. Just west of Raleigh near Siler City, we started seeing Dogwood trees in full bloom. By the time we got to the coast, we were seeing white and pink ones. 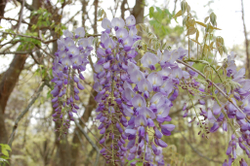 Just after we went around Pittsboro, NC and crossed Jordan Lake on Route 64, we began to see huge areas of Wisteria. I stopped and snapped this picture at a park entrance. Of course there are plenty of Redbuds, tulips, and daffodils blooming in Roanoke. Spring is rapidly heading north. Sunshine, blue skies, warmth, beautiful blooming flowers, and colorful trees make a huge difference in your outlook on life. As much as I loved living in the North, getting snow in April was not one of my favorite events. When the snow extended into May, it really began to take a psychological toll. We live in a wonderful world, I guess growing things mean a lot to me so watching plants grow from March into December in some ways makes my life richer. I can understand the argument that if you only get six months of growth that you appreciate it more, but I will take the nine months. I was always amazed at how all the extra sunlight made Canadian plants grow very quickly. Still it would be really hard to catch up with my Coastal NC tomato plants which rewarded me with blooms on April 9 this year. With some heat and luck, I might get tomatoes the first week of June. That might be one of the ultimate pleasures of being in the South.